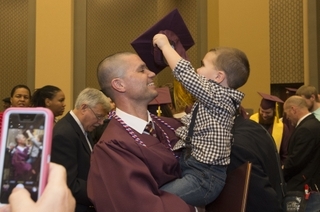 NEWPORT NEWS, Va. (Feb. 22, 2016) -- Huntington Ingalls Industries (NYSE:HII) hosted commencement exercises on Saturday for 170 graduates of the company’s Apprentice School located at Newport News Shipbuilding. The exercises were held at the Liberty Baptist Church Worship Center in Hampton in celebration of the graduating class of 2015. Of the 170 graduates, 17 are military veterans or reservists. 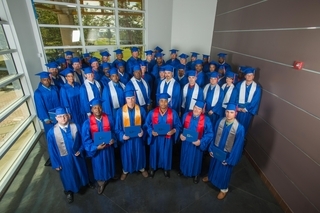 Seventy-six completed an optional, advanced program (advanced shipyard operations, cost estimator, modeling and simulation program analyst, and nuclear test technician or production planner). Forty-seven apprentices earned “honors,” 11 earned “high honors,” and five earned “highest honors” under the school’s Honors Program, which combines academic and craft grades to determine overall performance. Athletic awards were presented to 21 graduates, and 14 achieved a perfect 4.0 grade point average in their required courses. The recipient of the Homer L. Ferguson Award was Eric Bevis. The award is granted to the graduate with the highest grade point average in combined required academics and crafts. Bevis served in the U.S. Navy for 11 years before beginning his career as an electrician at Newport News. After four years with the company, Bevis entered The Apprentice School, where he completed an optional, advanced program in advanced shipyard operations and the Frontline Foreman Accelerated Skills Training (FAST) program. 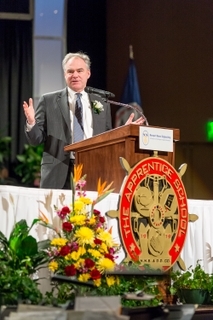 Addressing his fellow graduates, Bevis highlighted the opportunities awaiting them. 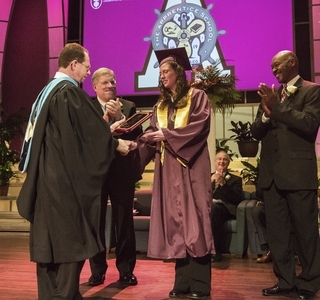 The Apprentice School accepts about 225 apprentices per year. The school offers four- to eight-year, tuition-free apprenticeships in 19 trades and eight optional advanced programs. Apprentices work a 40-hour week and are paid for all work, including time spent in academic classes. 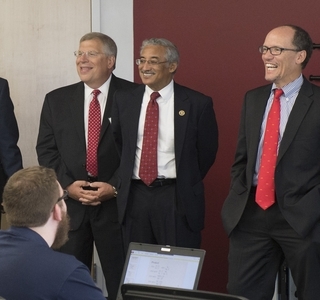 Through partnerships with Thomas Nelson Community College, Tidewater Community College and Old Dominion University, The Apprentice School’s academic program provides the opportunity to earn associate degrees in business administration, engineering and engineering technology and bachelor’s degrees in mechanical or electrical engineering.